Rock Your New Year’s Resolutions in 2017! Ever wonder why it’s so hard to keep your New Year’s Resolutions? I mean, you start out so full of motivation and determination and then, by about week three, you’re on the couch huffing potato chips out of a bag and watching Grey’s Anatomy reruns. Why? It could be that you’ve missed an important step in planning for success: harnessing the power of a support group. Humans are wired for connection with other humans –trying to launch a solo effort is a LOT harder than doing it with a support system. Studies have shown that joining with like-minded people increases your chances of success in every endeavor from stopping smoking to losing weight. But you don’t need to join an expensive organization. Get started today with SignUp.com for a free, fast and flexible way to assemble your own support community! 1. Identify Your Goal. Say your goal is to begin an exercise program. Create a SignUp on SignUp.com, and then use social media to spread the word so that like-minded participants can join the fun. People can sign up from their smart-phones or computers around the clock, and once you set a schedule, they’ll received automated reminders. 2. Identify Your Group Process. 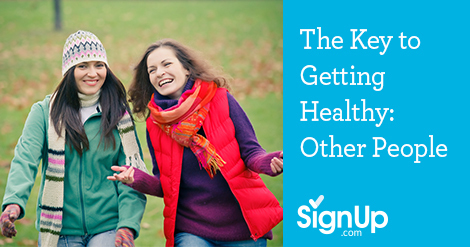 If the goal is to exercise three times per week, decide how best to buddy up! Do you want to meet before work, or after, or over lunch? On SignUp.com, it’s super easy to create an event/task on one day and then copy it to any number of upcoming days and edit description/times, etc. So you can set up your SignUp to "Join me for a lunchtime walk around the park" on Monday at noon and copy it to Wednesday and Friday too! 3. Identify Potential Pitfalls. Make sure you have a plan in place for inclement weather. (Meet at the mall for a quick walk, or take a spin class together!) And offer enough opportunities to accommodate everyone’s schedules. Touch base with people –the power of the group is in the interaction! Create a private Facebook Group so people have a place to post when they are feeling unmotivated, and then make an effort to support them. 4. Track Your Progress. Wearable fitness trackers and smartphone health apps are great for monitoring your own healthy progress in terms of heartrate, miles covered, and activities -- and SignUp.com automatically generates weekly reports of your group’s progress getting together. Plus, by simply accessing the SignUp from your computer or smartphone – you’ll know the percentage of spots filled at a glance, and who is signed up. This allows you to adjust the schedule in case a time slot or activity isn’t working for your participants. 5. Celebrate Your Success! It’s important to celebrate milestones along the way to keep people energized and motivated. It doesn’t have to be elaborate, but people respond best to positive reinforcement and to having their progress noticed. For example, if your goal is a fitness support group, you could celebrate the people who consistently show up by giving them a set of new shoelaces or add a SignUp after the first complete month to coordinate potluck salad lunch and recognize everyone then! If you believe that the definition of insanity of doing the same thing over and over again and expecting different results, make a change this year by tapping into the power of the group and watch your dreams for 2017 come true! You may also like, New Year 2017: Resolutions and Solutions.